So we decided to tell you in detail about the main criteria that make the simulator interesting and, most importantly, profitable. First of all, it is important to understand that the main part of any virtual reality simulator is not the machine body, not “hardware”, but the content! The games and the film make the simulator attractive to customers. At the same time, we want to convey to everyone that not the number of films, but their quality and exclusivity attract people over and over again. There is no need to chase after hundreds of films downloaded from the Internet, which are offered by other manufacturers of attractions of virtual reality. Thanks to free access, they lose their uniqueness and most often the quality of such films leaves much to be desired. As a result, people get tired of watching the same films in different places on similar simulators, they lose interest and start looking for something new, something that can’t be found anywhere else. All content for our virtual reality simulator X-Machine is created by Dreampix animation studio and is 100% unique. We value our content and carefully protect it from illegal copying. 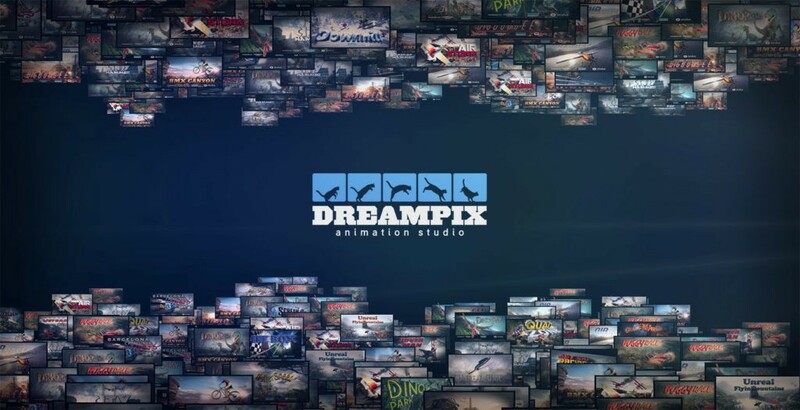 Movies and games from the Dreampix studio are always thought out to the smallest detail, so that immersion in the virtual world be most real. Another important feature of the X-Machine is its interactivity, which allows a person to feel as comfortable as possible. There are no hard drives that throw a player from side to side, depriving him of support under his feet. Driving attractions are remnants of 5D cinemas, and for a virtual reality simulator there is absolutely no need to move a person in space. Putting on virtual reality glasses you experience total immersion in the world of VR, so additional hard shocks, jerks and lack of support under your feet often cause unpleasant sensations, from mild dizziness to nausea and complete disorientation in space. 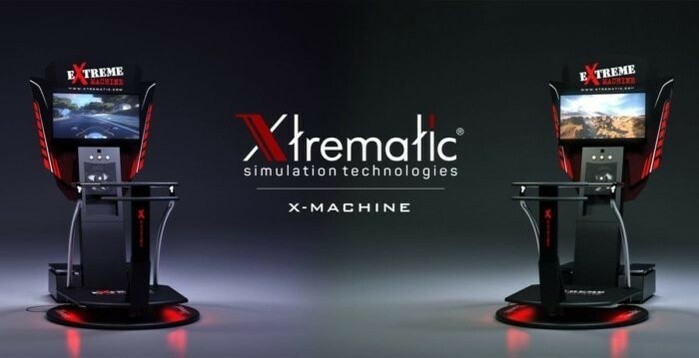 The interactive platform of X-Machine allows a person to independently determine body position, bend to the side convenient for him and fully control the space. Such a system prevents the manifestation of any discomfort and allows you to fully immerse yourself in the game. A distinctive feature of our simulator is a multiplayer game! This is a great opportunity to attract even more visitors, because the competitive spirit immediately wakes up and the adrenaline level rises. Friends come again and again to fight in a battle and find out who is cooler. We also connected the audio chat function, which allowed the players to talk during the ride and made the network game even more exciting. 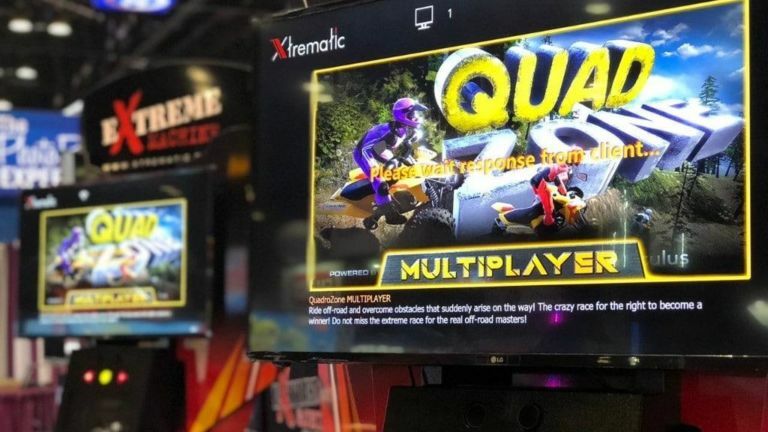 Xtrematic offers several simulator configuration options that differ in game packages. We always reserve the opportunity to purchase films and games that interest you, new rides or theme packs, such as Dino Pack and Coaster Pack. Also an important feature is the possibility of branding our films, which is especially convenient for event agencies, because then one and the same client will return exactly to you in order to rent the Machine with his own logo. Content on completely different topics: racing, roller coaster, dinosaurs, flying, skiing, rafting and other extreme sports do not tire visitors, allowing everyone to find himself in something that he has never tried before and experienced what he has never experienced.